The NSW GBOTA will host it's inaugural retiree days the first weekend in March 2018. The days are set to allow participants and adoptee families to bring their retired races down to the track for the opportunity to socialise with other greyhounds and families. Too often it is assumed that members of our community do not have retired greyhounds, who are living great post racing lives. As a way of breaking down theseviews, we are encouraging participants and families outside of the sport which have adopted a greyhound to come together for a day out. 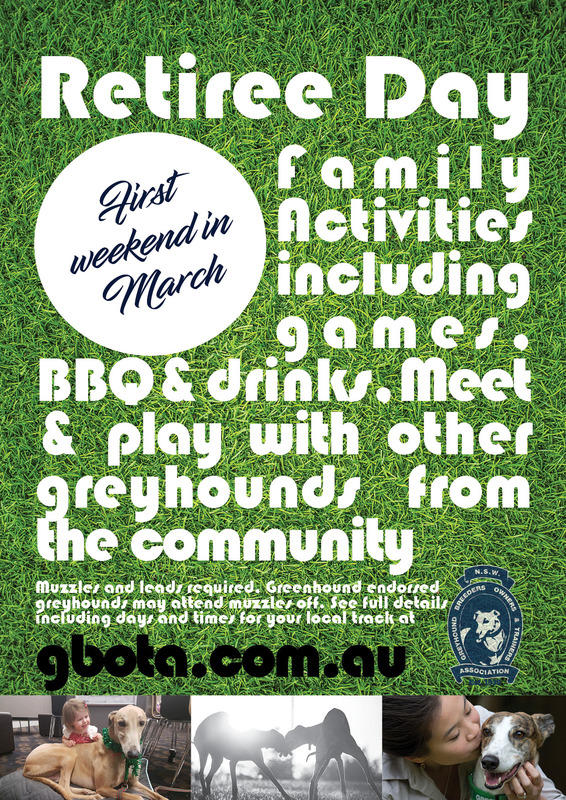 The NSW GBOTA will be providing a BBQ for attendees and range of family games for the kids to partake in. So bring friends and family along. The days will be scheduled more regularly, with other Clubs working up to having other breeds welcome also. The first event will be greyhounds only. Greyhounds will need to come with a muzzle, collar and lead on. Endorsed Greenhounds may partake unmuzzled. Off leash opportunities will be provided.